The Bills beat the Indianapolis Colts by a score of 13 – 7 in overtime yesterday at New Era Field. What did we learn about the Bills is the win? Not much! No team can ever expect to play in those type of conditions. I would estimate that about 6 to 8 inches of snow fell during the game and it became not a football game, but survival of the fittest. With those conditions, game plans get thrown out. The run game becomes important and a team just hopes that it doesn’t make a mistake that could cost them the game. Still there were some excellent performances. Bills running back LeSean McCoy proved to be the hero of the game scoring on a 21 yard run with just 1:33 left in overtime to win the game for the Bills. Had McCoy not gotten at least a first down the chances of the Bills kicking a 30+ yard field goal were minimal. 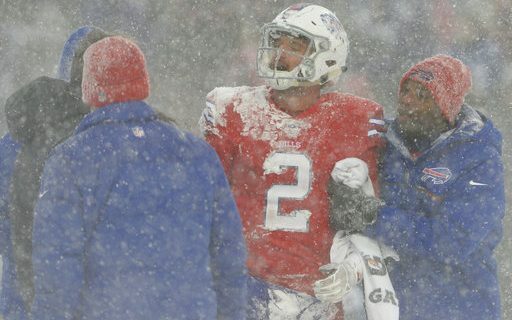 McCoy usually needs a dry field to play at his best yet in the snow he ran for 156 yards on 32 carries. Maybe we need more December snow games for him? Rookie Nate Peterman actually threw the ball well when asked, completing five of 10 throws for 57 yards and a touchdown before he left the game with a head injury. To be as accurate as he was under those conditions was nothing short of amazing. The Colts started off by running the ball on just about every play and had some success but couldn’t get a real drive going. When they fell behind 7-0 they tried to throw more and quarterback Jacoby Brissett actually threw 22 passes with 11 completions for 69 total yards. Regardless, when either team tried to throw, it was an exercise in futility. That said, the catch made by Bills receiver Deonte Thompson to set up the winning touchdown run was nothing short of miraculous. Thompson had a Colt defender wrapped all over him but showed the concentration to reel in the throw. What the win did was keep the Bills hopes for the playoffs alive. Their record is 7-6 on the season and they are tied with two other teams for the final Wild Card spot. Both the Los Angeles Chargers and the Baltimore Ravens also have 7-6 records at this time. With the Chargers win over the Bills a few weeks ago they win the first tie breaker. Baltimore also is ahead of the Bills because of their better conference record. What this means is the Bills have to win out and hope for help in order to make the Playoffs. Buffalo still has to play Miami both home and away as well as travel to New England. Baltimore has to play at Cleveland and then home against the Bengals and Cleveland. The Chargers have to play at Kansas City, at the Jets and finish out at home versus the Raiders. Like it or not, the Bills have the toughest road to travel and Baltimore seems to have the more favorable schedule. Regardless of if the Bills make the playoffs or not, this team is vastly improved over last year’s team. The team is laying a solid foundation for the future and with the high number of draft choices they have for this upcoming draft the future looks bright. For more from Greg Gabriel, visit his author’s section at Buffalo Sports Page.